sted in the progress and welfare of the county and state and are ready to lend their influence to the furthering of any measure calculated to advance the common interests. James McAllister, one of the most extensive stock and grain farmers of central Nebraska, and the owner of eighteen hundred acres of land, all in Algernon township, has always been closely identified with the best interests of his county and state and is widely and favorably known. He was born in St. Louis, Missouri, June 10, 1849, third of the ten children of William and Ellen (McTwigen) McAllister. He has a sister, Mrs. Alfred O'Brien, in Mason City; a brother, Robert H., in Grand Island, and another, A. S., in Donovan, Nebraska; a sister in Pueblo, Colorado, and others are deceased. Both parents were natives of Edinboro, Scotland, and came to America about 1846, locating first in Rhode Island, going thence to St. Louis, where they resided two years. In April, 1850, they settled in Pottawattamie county, Iowa, three miles from Council Bluffs, and resided there thirteen years. They came to Merrick county, Nebraska, in 1863, where the father secured a homestead near Grand Island. Both he and his wife died in Grand Island, he October 29, 1886, and she March 9, 1900. 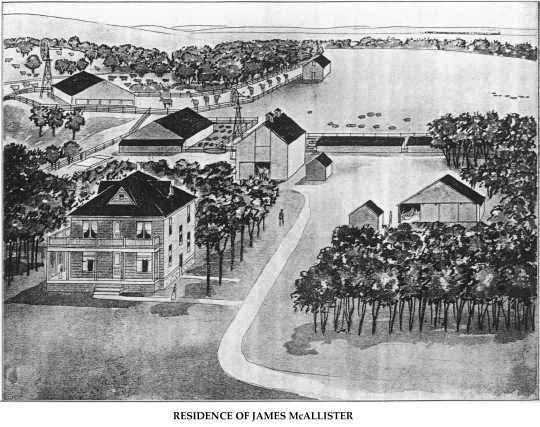 James McAllister accompanied his parents to Merrick county when he was about fourteen years of age, and grew to manhood on a farm, receiving his primary education in local schools, and for three years attended high school at Council Bluffs, Iowa. For fifteen years he worked in the employ of the Union Pacific railroad company, running for nine years as conductor on one division, between Grand Island and North Platte, and had been employed in the car department two years before entering the train service. He was united in marriage at Council Bluffs, December 2,1873, with Miss Alice Allison, a native of Pennsylvania, daughter of Thomas and Eliza (Hetrick) Allison, also natives of that state. Mr. Allison died in Council Bluffs in 1894, and his widow resides with Mr. and Mrs. McAllister. Another daughter, Mrs. W. R. McAllister, lives in Grand Island, and one son and one daughter live in Iowa. In the spring of 1882, Mr. and Mrs. McAllister brought their three children to Custer county, securing a homestead of one hundred and sixty acres in section thirty-five, township fifteen, range seventeen, which is still the home place. They also took a tree claim of one hundred and sixty acres. Six children have been born to them: Hugh L., married, and living in Custer county, has two children; James H., at home, Ethel, wife of George Weimer, lives in Seattle, Washington; Edith, at home; one son and one daughter who died in infancy. Mr. McAllister was instrumental in organizing school district number nine, and for ten years served on the school board. Having been one of the earliest settlers of his part of the county, Mr. McAllister has passed through the various stages of its history. He has added to his possessions from time to time. and now has eleven hundred acres of land in the home place, besides other land near by. He met many trying experiences and discouragements naturally incidental to pioneer existence, but, through hard work and energy, triumphed over these difficulties. For some years he carried on freighting between Omaha and Kearney, and also to and from Fort Cottonwood. When he erected his first farm buildings, he hauled the lumber from Grand Island, a distance of about sixty-five miles. He is engaged extensively in stock feeding, and also raises considerable grain. In 1908, he erected a fine modern farm house of concrete blocks at a cost of six thousand dollars, and also has substantial barns and other buildings. A hot-air system of heating was installed, as well as a complete system of water and sewerage, and the entire house is lighted by acetylene gas. We are pleased to give a full-page view of this fine. modern country home, with its many large barns and outbuildings, elsewhere in this work. Mr. McAllister was a democrat until Cleveland's last term, and since that time has voted independently of party lines. He was formerly an Odd Fellow, and is now a member of the Ancient Order of United Workmen. Edward Pufahl, a well-to-do farmer, energetic and industrious, a typical representative of the German race, who came to this country to establish a home and accumulate a competence for his old age, resides on his farm of two hundred and twenty acres, which is situated in section twenty-five, township twenty-five, range two, and on which five acres are planted in trees. Mr. Pufahl has been for many years a resident of northeastern Nebraska, having settled in Pierce county in 1892. Mr. Pufahl was born November 10, 1850, in the village of Sacho, district of Pegenwalde, province of Pommerania, Germany, and is the son of William Pufahl (also a native of that province), who was born in 1820, and died in America at the good old age of eighty-two years. He was employed as a woodworker in the factories in the fatherland, and in his younger days served his native country in the army. Mr. Pufahl's mother was Sofia Braun, also a native of Pommerania. and attained a good old age. which he cultivated some eight years, then sold and bought his present farm in Pierce county, near Hadar, in 1892. To this he has added two eighty-acre tracts, purchased at different times. Mr. Pufahl was married, June 14, 1878, to Miss Edith Oestrieth, who was born in the village of Schauen, province of Pommerania, Germany, in 1856, a daughter of August and Mina (Primnoh) Oestrieth. They came to America, and settled in Wisconsin in 1866. To Mr. and Mrs. Pufahl have been born five children, whose names are as follows: August, married Minnie Kloepke, and lives in Madison county; Louis; Edward, married Ella Wachter, and is farming near his father's place, and Emil. Willie, the second child, died when quite young. The family are members of the German Lutheran church, and Mr. Pufahl casts his vote for the candidates of the republican party. James W. Dodd, the subject of this biographical writing, was born in Canada, July 16, 1864, and came to the United States of America in the month of June, 1874, with his father, mother, one brother and seven sisters. His father purchased a farm on the southeast quarter of section fourteen, township fourteen, range eleven, which consisted of one hundred and sixty acres, and he also purchased one hundred and twenty acres of railroad land. James W. Dodd has lived in Howard county continuously up to the present time, and now resides on the southwest quarter of section eleven, township fourteen, range eleven, where he owns a well-equipped grain and stock farm. The Methodist Episcopal church is located on the southwest corner of the farm, this being one of the first churches in this section of the state, and his parents helped to build it. Mr. Dodd was married to Miss Alice Crow, January 5, 1887. She was born in Canada, and came to Howard county, Nebraska, with her parents in the early pioneer days. Mr. and Mrs. Dodd have had six children born to them, all of whom are residing under the parental roof: Geneva, Elsie, Mabel, James William, Alice Margaret and Francis Wilmer. Mrs. Dodd's parents reside in St. Paul, Nebraska, and are well-known old-time citizens of Howard county. Mr. Dodd was fifth in a family of fourteen children, three sisters of whom are married and reside in Howard county, four sisters reside in Nebraska, other than those in Howard county. There is one brother and a sister in Wyoming, and the father, mother, two other brothers reside in Canada, and two girls died in Howard county. Mr. Dodd has held several local precinct offices, which he filled creditably to himself and satisfactorily to his constituents. He has always been active in affairs pertaining to his county and state, and is widely known as an upright, fair-minded citizen. Both Mr. and Mrs. Dodd came from Howard county pioneer families. Mr. Dodd's father, James F. Dodd, was born in June, 1835, in France, although of English descent, and came to Canada when but four years of age, with his mother, his father having come about a year previous. He came into Howard county, Nebraska, in June, 1874, with his wife and nine children, and purchased land as previously stated, farming same up to the time of leaving Howard county. There were five children born in Howard county. He sold out in the spring of 1904, and, with his wife and two children, went to Alberta, Canada. During his residence in Howard county, he was well known for his splendid character and good qualities. The Dodd family, father and son, have both contributed largely to the upbuilding and advancement of this section of the country, and are prominent factors in the making of Nebraska history. came to Nebraska, and for several years was a minister in that state, in the service of the United Brethren church. Another son, Valentine A. Zimmerman, also became a resident of the state, and a daughter, Alverda, (Mrs. Charles Whitmore) came to Nebraska with her husband in 1885. Those of the children who now live there are Abraham Lincoln, the subject of this sketch; Mrs. Bone, Mrs. Whitmore, and Reverend John Zimmerman, who occupies a pulpit at Orchard, Nebraska. The other members of the family are scattered into several states. Abraham L. Zimmerman eventually took up a homestead in the same locality as his brother George, and at that time had few neighbors, few homesteads having been filed in the neighborhood, so that the two were among the pioneers of the region. In 1882 be returned to Ohio to be married, and there, February 1, 1882, he was united with Miss Etta Bone, a native of McConnelsville, Ohio. Her parents, Jacob and Elizabeth (Harkless) Bone, were also natives of the Buckeye state. Mr. and Mrs. Zimmerman began housekeeping on the Nebraska homestead, where they .lived until 1892. Prior to the time the railroad passed through Loup City, in 1886, Mr. Zimmerman had a small general merchandise store on his farm, and was instrumental in securing a postoffice there, known as Cleoria, of which his wife was postmistress. They were also the prime movers in securing the erection of the first school building in the neighborhood, and the first protestant church edifice in the county, it being erected by a congregation of the United Brethren. During the years 1892 and 1893, Mr. Zimmerman lived in Loup City, but returned to the farm in 1894, and in the following year he entered the ministry of the United Brethren church, serving three years as pastor of three congregations near Gibbon, two years at Marquette, and one year at Aurora, during which time he resided two years at Gibbon, two at Marquette, and one at Aurora, In 1901 he abandoned the ministry, and returned to his farm, at that time embarking in the real estate business in company with Mr. O. Gunnarson. In 1903 he brought his family to Loup City, where they expect to make their permanent home. They have a modern, comfortable residence there, pleasantly located near the central part of town, During the many years he carried on agricultural pursuits, he had various business interests outside his farm, and he has had much to do with the advancement of various interests in central Nebraska. Every enterprise with which he has been connected has benefited through his energy and business foresight. Mr. Zimmerman and wife have three children, namely: Archie O., Elizabeth and Elva E. Archie O., was born in Sherman county, January 30, 1885, lives on his own farm near Loup City, and has one child; Elizabeth, married William Owen, and they have one child, and live at Sunnyside, Washington, where Mr. Owen is connected with the United States reclamation service; Elva E. Zimmerman, for a number of years a teacher of vocal and instrumental music in Loup City, was married, March 19, 1911, to R. H. Mathew, who served four years as county attorney, and was at the time of his first election the youngest official ever elected to that important position in the state. Mr. Zimmerman's first dwelling on his homestead was a small "soddy," with a dirt roof, in which he lived three years, and which was replaced later with a commodious house, lathed and plastered, and in this the family lived for four years. Since selling the homestead farm, Mr. Zimmerman has purchased a farm of two hundred and forty acres north of Loup City, and another of three hundred and twenty acres south of town, besides a number of small tracts. He also owns a fine tract of timber sixteen miles south of Richmond, Virginia, which was an old plantation before the war, and has since grown up in a forest of fine trees. Mr. Zimmerman is a republican in politics. and a member of the fraternal order the Loyal Mystic Legion, and also the Modern Woodmen of America. For over twenty-eight years the gentleman whose name heads this personal history has been associated with the agricultural interests of Madison county, and as an old settler and one of her worthy citizens, he is prominently known. Mr. Baker is proprietor of one of the fine farms of this locality, and resides on section four, township twenty-four, range four. He has accumulated his property and gained his good name by his persistent and honest labors. Mr. Baker is a son of Daniel and Fannie (Moore) Baker, and was born in Madison county, Iowa, December 7, 1851. His father is a native of West Virginia, of German descent. The mother claimed the Keystone state as her birthplace, she being descended from Holland stock. Mr. Baker remained in his native state until he reached the age of thirty-two years, receiving the usual schooling, and there followed the occupation of farming. He came to Madison county, Nebraska, in 1883, and upon deciding to locate here, bought the Thomas Eberly homestead, He has steadily improved this place until he now has a fine farm of six hundred and forty acres, on which are ten acres of fine orchard and forest trees. of all who know them, and their friends are many. Mr. Baker is a substantial, progressive citizen and a successful mail of affairs. He has done much toward the betterment of conditions in his home county and state since his residence here, and well deserves the prosperity and comfort he now enjoys. He is a member of the Methodist church, and of the Woodmen, Odd Fellow and Workmen lodges. He is a democrat. Perhaps there was none of the early pioneers of this section of the state who were better or more widely known than the above named gentleman. For fully a quarter of a century he was a resident of this state, most of the time being engaged in the mercantile business, and at all times being recognized as one of the foremost citizens of the community in which he resided. Edgar Varney was born in Corinth, Saratoga county, New York state, June 30, 1839. His early life was spent in that section of the east, and it was there that he secured his education. In March, 1868, he was married to Mary Emelia Tiffany, daughter of Thomas and Arvilla (Hogle) Tiffany, also a native of New York state. Mr. Varney first came to Nebraska in 1873, when he took up a claim in Hall county, near Grand Island. He occupied this claim and farmed until 1880, when, with his wife and family, now numbering eight children, he came to Custer county, first settling in Westerville, where he engaged in mercantile business. Six years later, in 1886, Mr. Varney moved from Westerville to Ansley, putting up and opening the first store in that town. From this time until 1900, he was known as one of the successful merchants of that section of the country. He retired from active business at this time, although still retaining and manifesting a great interest in public affairs. On September 23, 1908, he departed this life, leaving his family and a large circle of friends to mourn his loss. All the eight children born to him are still living: Mrs. Judge Armour, resides in Broken Bow, Nebraska; Mrs. R. E. Brega and C. E. Varney live at Callaway, Custer county; Mrs. Anthony Wilkinson is in Grand Island, while T. T., S. P. and J. H. Varney and Mrs. E. P. Gaines are still residents of Ansley. Thomas T. Varney was born in Corinth, New York, on May 2, 1872. He remained with his parents, moving with them to Nebraska, until 1892, when he first began life for himself as one of the members of the firm of Fairfield & Varney of Ansley. Three years later he disposed of his interest in this firm in order to have more time to devote to other matters in which he was interested. In 1902 he assisted in organizing the First National Bank of Ansley, and has been connected with that enterprise ever since. He was the first vice president, and in 1906 became cashier, which position he still occupies. When organized, the bank had a capitalization of twenty-five thousand dollars, with a surplus of fifteen thousand dollars. This bank is one of the solid financial institutions of central Nebraska, and now occupies a fine new building, modern in all of its appointments. Thomas Varney also has large interests in Custer county outside of the bank, and is one of the prominent citizens of this section. He has devoted considerable time to public affairs, and was postmaster for ten years, first receiving that appointment in 1896, and has served as a member of the town school board for several terms. He has always been connected with every enterprise tending to the growth and development of the county. An instance of a man's following the bent of his own mind, and following a chosen vocation after a less agreeable one had been selected for him, is illustrated in the life of William Huse, deceased, for many years prominently connected with journalism in northeastern Nebraska. His father, Reverend Nathaniel Huse, a minister of the Episcopal church, recognized but three professions - the law, the church and medicine - so one of these his son William must pursue. He chose the law, although his heart was in journalism. William Huse was born in Binghamton, New York, in 1828. His mother died about the time of his birth, and he was reared in the family of an uncle at Southampton, where he attended the common schools, most of his higher education being acquired through his own efforts. He studied Latin grammar before taking up English. He was admitted to the bar in New York. He moved to Bowling Green, Missouri, in the fall of 1865. The local animus toward northern men was not cordial or agreeable in that section in those days, and early in the spring, Mr. Huse moved to Janesville, Minnesota. He remained there until 1872, when he came to northeastern Nebraska and made it his home nearly all his remaining years. son is now editor, he having purchased his father's interest, and is now conducting the best daily paper published in any town of like size in the west. Mr. Huse was proprietor of the "Newcastle Times" for nearly a year, and in 1899, with his son, Eugene W. Huse, Mr. Huse went to the coast and purchased the "Republican" at Klamath Falls, Oregon, remaining in that country four years. In 1903, they returned to northeastern Nebraska and purchased the "Wayne Herald" in October, 1903; a year later they sold to E. Cunningham, with whom the son remained as manager until 1906. Mr. Huse was married in New York to Miss Ruth Almina Berry, a native of Chautauqua county, March 17, 1849. After the death of Mr. Huse in 1906, she made her home with their son, Eugene W., until her death in March, 1911. Mr. Huse was a fluent writer, as well as a ready speaker. He took delight in the stories of pioneer days and wrote many of them for the different journals he published; these he revised and elaborated, publishing them in an attractive little volume which in time will be invaluable in compiling a fuller history of the state. Mr. Huse was a man of broad mind, of wide reading and culture, and has left his impress on the thought and character of the west which will be continued for years to come, through the inherited mentality of his sons. Among the old settlers of Nebraska who have spent many years in the work of building up and developing the commercial industries of a new country, the gentleman above named holds a prominent place. George J. Wolcott was born in Lafayette county, Wisconsin, March 4, 1857, and was second of seven children in the family of Oliver and Calista (Harris) Wolcott. Mr. Wolcott grew up to his young manhood days in Iowa, being but a small boy when the Wolcott family moved from Wisconsin to that state, where our subject learned farming and received such advantages as were afforded by the public schools. In June, 1880, the Wolcott family moved from Iowa to Merrick county, Nebraska, where they purchased a good acreage of land and became largely interested in stock. On December 24, 1885, Mr. Wolcott was united in marriage to Miss Mary Eatough at the parents home in Merrick county. Miss Eatough was born in Merrick county, the daughter of James and Sarah (Foot) Eatough, and to this date is the oldest living first born girl of Merrick county. The Eatougbs were one of the first pioneer families of this county, coming here before Merrick county was organized and was known as Lone Tree station. They arrived here in 1862. Mr. and Mrs. Wolcott lived on the old home farm until 1901, when in August of that year they moved to Central City on their small farm of thirty-four acres in the southeast part of town, so as to give the children advanced schooling. Mr. and Mrs. George Wolcott have had eight children born to them, all of whom are living: Mabel, who is attending the university; Calista, a teacher in the public schools; and Vella, Junita, Olived, Enid, Marie, and George, junior, all of whom reside at home. Mr. and Mrs. Wolcott and children are of the well-known Merrick county families, the children all being natives of this county, and they are interested along social and educational lilies. The family of Wolcott is one of the larger representative families of Merrick county, Nebraska. For the past quarter of a century P. J. Greiner, subject of this review, has resided on section tewnty-four [sic], township thirty-two, range five, Knox county, Nebraska, where he has a good farm and is well known as a highly esteemed, substantial citizen. Mr. Greiner since his coming to Nebraska, has always done his full share in advancing the best interests of his home county and state, and has been a factor in helping to bring the present prosperity the state now enjoys. Mr. Greiner is a native of Iowa, his birth occurring in Dubuque, April 11, 1864, and he is the son of John and Margaret (Clemens) Greiner, both natives of Tryer village, province of Prussia, Germany, where the father learned and followed the stonemason's trade. Our subject's parents left their native land for the west to make a fortune for themselves, sailing from Bremen to New York City on a sailboat, and after a voyage of one hundred and three days landed in the United States. The family settled in Iowa, where our subject was born and raised to manhood. year burning every spear of Crops for that season; and in 1896 and 1909 he experienced another severe loss by hail. But through all these vicissitudes Mr. Greiner has prospered and now owns a fine farm of three hundred and sixty acres, of which be is justly proud. In 1892 Mr. Greiner was married to Miss Julia Everett, and they are the parents of five children, namely: Frank, Maggie, Ethel, Clara, and May. They are a fine family. James B. Long, who departed this life in May, 1891, was among the very earliest settlers of Boone county, and succeeded in accumulating a valuable estate through industry and good management, becoming one of the best known men of his region, and at the time of his death having a host of friends to mourn his loss. Mr. Long came to Boone county, Nebraska, in May, 1871, driving overland by team from Iowa county, Iowa, accompanied by his two sons, Winfield and Elihu, and his brother-in-law, George B. Hyde, all of whom became homesteaders here and are among the well known pioneers of this part of the state. Mr. James B. Long took up the sixth claim filed in Boone county, on section twenty-two, township nineteen, range five, and his son was the next one in line. The entire party returned to Iowa in July, and in October our subject, his two sons, a daughter and the mother, also Mrs. Long's brother and family, came back to Nebraska, traveling by wagon and team. Winfield Long was married previous to coming here, and he also brought his wife and child with him. In 1873, Mr. Hyde was accidentally killed by drowning, or slain by Indians while herding cattle, as he disappeared and was never afterwards heard from. The Long family were among the best pioners [sic] here, our subject always, being identified with the best interests of his locality, and was active along all lines in the upbuilding of the county, although quiet and unobtrusive in manner, and became well known as a successful and prosperous agriculturist and stockman. Mr. Long's death occurred on the home farm, May 8, 1891, his wife departing this life the year previously. Two sons and two daughters survive, Winfield S., now of Chariton, Iowa; E. T. Long, Mrs. James Reynoldson and Mrs. Addie M. Phelps, all of Boone county. W. L. Seaman, a worthy and highly respected citizen of Antelope county, Nebraska, is a pioneer settler of this section of the state, and has done his full share toward the development of the better interests of his community. Mr. Seaman is a native of New York state, born November 13, 1865, and is the son of Walter L. and Agnes (Jolly) Seaman. Our subject's father was born in 1820, in the state of New York, and the family of Seaman had lived on Long Island for two hundred years or more; the house first built by a Seaman, in 1678, still stands. Our subject's mother was born in 1847, and is a native of New York state. Mr. Seaman with his mother came to Butler county, Nebraska, in 1877. They came direct from Troy, New York, but drove overland from South Bend, Indiana. On arriving in Butler county they rented a farm, living there about a year, and in 1878 came to Antelope county, where he took up a homestead and tree claim in sections fourteen, fifteen and seventeen, township twenty-eight, range seven, and had three hundred and twenty acres of land, first building a dugout where they resided six years and then in 1884 built a frame house. Mr. Seaman now has one hundred and sixty acres of land and twenty-five acres of trees, making a beautiful home place which is known as the "Jessup Farm." Mr. Seaman is practically a self-made man. He is well known along educational lines, having persevered in his studies under some little difficulties. He attended school at Gates college, and went to Grand Island business college, and then attended Normal school at Fremont, Nebraska. After completing his studies he taught school three years, in districts thirty-seven, fifty-four and seventy-seven. Mr. Seaman takes an active part in public matters in his community, and was postmaster at Jessup (on the old Star Route) for eighteen years from 1887 to 1905. During this time he had a general merchandise store in connection with the post office. Mr. Seaman is without doubt one of the leading old settlers of the county and has done his share in bringing about the present prosperity enjoyed in the region. When he first came to Antelope county deer and antelope were plentiful and on several occasions were known to come into his yard. Mr. Seaman is a member of the Ancient Order of United Workmen and the Masonic Order. He was brought up in the Episcopal church, but is now a member of the Congregational church and has always been a republican. were natives of Scotland and came to America in early life. They were married in Indiana and both died on the homestead in Iowa, the father in 1903 and the mother in 1855. In boyhood Mr. Wallace attended school near his father's home, being reared on a farm. As a young man he engaged in farming for himself and was married in his native country, April 2, 1876, to Miss Mary E. Sutton, who was born in Marshall county, Indiana. They lived in Iowa after their marriage until October, 1881, when they brought their two children to Custer, County, Nebraska, securing a homestead and timber claim adjoining, aggregating three hundred twenty acres of land, and this is still the home place. Mr. Wallce [sic] ahas [sic] brought his land to a high state of productiveness and is successful in his various enteprises [sic]. He owns six hundred and ninety acres of land and was the first man in the county to own pure bred horses, having for many years made a specialty of raising and dealing in horses and mules. In 1898 he erected a fine modern residence, fitted with many conveniences. In his early years on the farm he had to haul his produce to Grand Island to market, a distance of one hundred miles, and in those days he met the usual trials and discouragements of the pioneer He has been closely identified with the progress and development of the county and has a good standing with his fellow citizens. Five children were born to Mr. and Mrs. Wallace: Memory, married and living in Custer county; Pearl, at home; Della May, wife of Fred Peters, of Custer county, has four children; Howard and Wesley, both married and living in the county, the latter the father of two children. The family are well known in Custer county, where they have a large number of friends. Harvey Parks, who has spent all but a few months of his life in Valley county, Nebraska, resides on section thirty-five, township nineteen, range fourteen, where he is well known as a prominent young man of his locality. Mr. Parks was born near Nashua, Chickasaw county, Iowa. November 8, 1877, and was second of five children in the family of Charles and Annie (Simpson) Parks, who had three sons and two daughters. Charles Parks, who was born in Montgomery county, New York, came to Valley, Nebraska, in the spring of 1878, overland by prairie schooner route from Iowa, and after reaching his destination bought railroad land northeast of Ord. The family lived on the farm until 1898, being engaged in farming and stock raising. Mrs. Charles Parks died May 9, 1898, deeply mourned by her husband and family. Mr. Parks left the farm and now resides in Sargent, Custer county, where he is in the mercantile business, also still attending to his live stock intersets. [sic] The sons, Harvey, Walter and Glenn, reside in Valley county; and two daughters, Mrs. Charles Burdick and Mrs. Ernest Gifford, also live in Valley county. Harvey Parks, the principal subject of this sketch, was reared in Valley county, and his life has been that of a farm boy, receiving the usual school advantages. In 1898 he went out in life for himself, farming and stock raising. On March 22, 1899, at Ord, Mr. Parks was married to Miss Pauline Bradt, a native of Valley county, whose parents, Aaron and Clara J. (Harlow) Bradt, came into this county in the early years; the former was a native of Niagara county, New York, and the latter of Rock county, Wisconsin. Mr. and Mrs. Parks have been blessed with two children, Leonard and Lloyd. They now reside in their pleasant home in the east half of section thirty-five, township fourteen, range nineteen, where Mr. Parks has a fine stock and grain farm; he also owns the west half of section thirty-six, making all a six hundred and forty acre farm. On his stock farm, he has a herd of Hereford cattle, of which he makes a specialty, and other. finely bred stock. We call attention to an engraving of this farm home, situated as it is on the highest upland, giving a fine view of hills and the valley beyond. Mr. Parks and family are well known along educational and other progressive lines, and are highly esteemed. Mr. Parks is a successful farmer and stock man, and is one of the young men of Valley county who always take an active part in the upbuilding of their home county and state. He is independent in politics and a member of the Modern Woodmen of America. 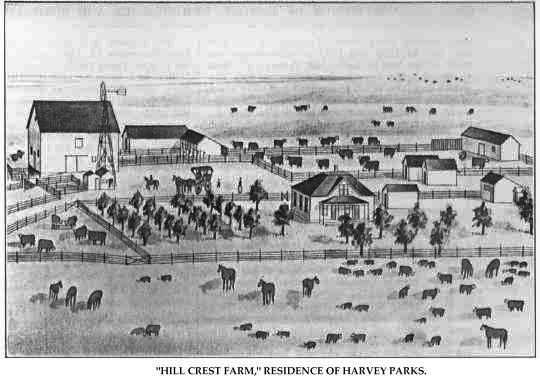 "Hill Crest Farm," Residence of Harvey Parks. James H. Cutler, a carpenter, builder and contractor of Custer county, has erected many of the best buildings in Anselmo, Callaway, Merna and Broken Bow, besides smaller towns in the region. He has helped put up many of the large grain elevators. However, in recent years he has paid considerable attention to farming and stock raising, in which he has been successful to a gratifying degree. He passed through the pioneer days of hardship and privation and he and his wife have reared a fine family in Custer county. He was born in Marshall county, Indiana, February 14, 1848, youngest child of the seven sons and three daughters of David and Lois (Hopkins) Cutler. He lived on the home farm until 1868 and on September 17, of that year, married Elmira Mosholder. After marriage they moved to Osage, Mitchell county, Iowa, making the three weeks' trip with a wagon and team. They reached Mitchell county in October, and in the fall of 1869 returned to Indiana, but soon after came back to Iowa, where Mr. Cutler worked on a farm for his brother.